As we gather around the table with family and friends, we take a moment to give thanks for our health, for our camaraderie, and for our resurging, never-say-die hockey team: the Buffalo Sabres. The spring and summer of 2018 brought many changes to the Sabres organization; changes in personnel, attitude and leadership. The biggest changes have come from and are represented by Jack Eichel. Foolish early returns from injury, inconsistent play and immaturity plagued young Jack over the last three years. The Sabres not only hadn’t seen the playoff horizon in the distance, they had finished in a different time zone from the postseason. 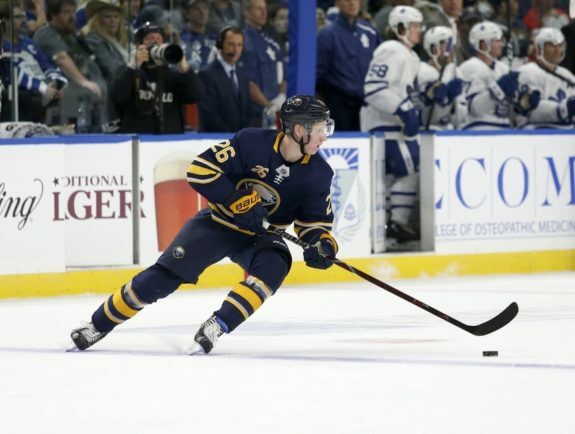 The hockey world that had been singing the praises of Connor McDavid and Eichel in the same breath three years ago had almost forgotten the Sabres’ young talent. McDavid, as the recognized benchmark for excellence, despite all his scoring, has only been able to lead his team to a finish above 23rd place a single time. These are the same Oiler teams that often dressed players drafted in the first round (of their respective drafts) numbering in the double-digits; many first-overall selections. As Americans sit down to turkey and all the fixin’s, McDavid’s Oilers are in quicksand at 26th place. Despite being in on 28 of his team’s 57 goals, McDavid’s Oilers can’t find secondary scoring and they can’t keep the puck out of their own net. The future looks bleak in central Alberta. Coach Todd McLellan was fired Tuesday afternoon. There doesn’t seem to be anything else that the highest paid player in the league can do to change his team’s fortune. 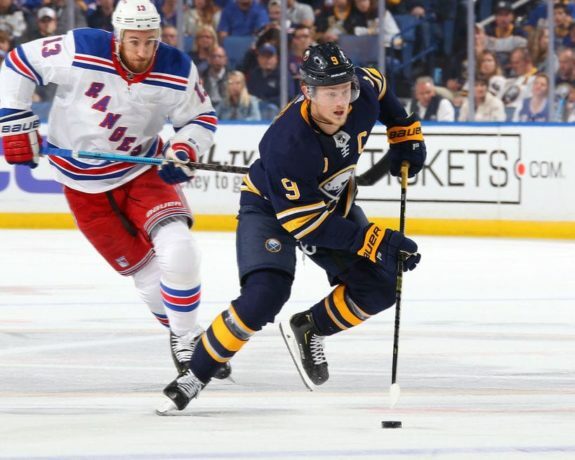 Meanwhile, in Buffalo, Eichel improved from 0.69 points per game (PPG) in his rookie campaign to 0.93 PPG in 2016-17, and up to 0.96 PPG last season. To date this year, he stands at 1.14 PPG, on pace for a 94-point season. And there is every reason to think these numbers will continue to rise. Not bad for a player on a team whose roster has turned over more than 50 percent per year for each of his full three seasons. This past summer, Eichel was named the Sabres’ captain by general manager Jason Botterill because he earned it. The transition to maturity and full-time franchise player became obvious in his end-of-season interviews. He has been the central tent-pole holding up the resurgent organization. A switch to a sweater bearing the No. 9 brought a clean slate and a positive attitude. This season, every player, regardless of age or seniority, looks to him to lead, and when the game has been on the line, he has delivered. Every player assigned to his wing has seen a bump in production. Eichel’s defense has improved as evidenced by his massive improvement in plus/minus (minus-25 last year to plus-2 today). He has scored on both of his shoot-out attempts. And he has shown leadership consistency in everything from hustling back to the bench at the end of every shift to appearing on the scoresheet in all but six games, never missing more than two consecutively. 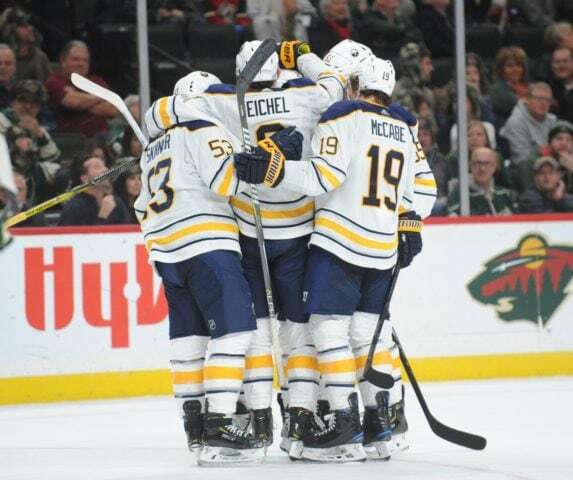 Eichel’s joy and affection for his teammates was apparent in his game-winning overtime goal celebration on Monday night as the Sabres overcame a 4-1 deficit to beat the recent two-time Cup-winning Penguins on their own ice in overtime. An OT winner is always special. The Eichel-led blue and gold have now won six games in a row and sit in fourth place in the league standings. Yes, Buffalo fans, the Sabres are, for the first time in too many years to count, in a playoff position and look to contend for the foreseeable future. In large part, Western New York has Jack Eichel to be thankful for this happy circumstance. The “Bogo Bunch” is no longer just a fantastic charity that assists Roswell Park in helping improve the lives of people fighting for theirs. This year, a healthy and rejuvenated Zach Bogosian is providing grit and leadership to the Sabres’ surprising defensive corps. Together, with Rasmus Ristolainen and Marco Scandella, this trio leads the way for the strong Buffalo blueline. Ristolainen, after a summer in which he posted superhuman training videos, is again gobbling huge minutes anchoring the blue-line while chipping in timely offense. While accumulating 11 points in 21 games, he’s delivered 72 hits, good for third in the league (behind William Carrier and Ryan Reaves). Nine-year veteran Marco Scandella, who was injured when sacrificing himself by blocking a shot in Pittsburgh, is a reliable stalwart, especially on the penalty kill. Most importantly, these three are providing a stabilizing and supportive setting for the younger defensemen, particularly the teenage wunderkind, Rasmus Dahlin. With Casey Nelson returning to the line-up and notching his first goal of the season on Monday in Pittsburgh, all seven members of the active blueliners have goals this season. The group now has twelve goals. Last season the defense corps didn’t manage their first until December 5th. Even Nathan Beaulieu, who had seemingly played his way out of the league, has had a dramatic turn-around; he’s a plus-6 with four points in twelve games. He is a perfect example of what can happen with a positive attitude, a lot of hard work and a supportive environment. Lawrence Pilut and Zach Redmond are tearing things up down on the farm in Rochester at 22 and 21 points respectively, through only 17 and 15 games. And with a renewed Brendan Guhle finding his game, the Sabres defense cup runneth over. Great statistics are enviable, but the true test of great goaltending is the ability of a netminder to give his/her team a chance to win each and every game. This year, the Sabres are blessed to have two goalies who provide that opportunity and have great stats. 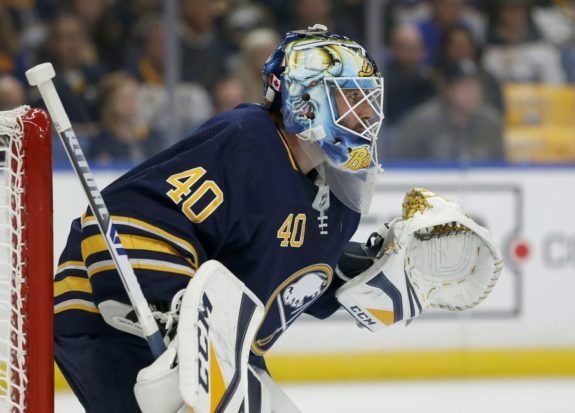 Thirty-three year-old Carter Hutton has clawed and scratched his way to a well-deserved starting position as Buffalo’s No. 1 goalie. Reserved yet confident, he stays ever-focused while he battles every shot. He’s boasting a 9-6-1 record with .917 save percentage and a 2.61 goals against average. More than anything, “Hutts” has made the big save at the right time, allowing for the team to close out leads and come back when they have been behind. And he provides perspective and leadership to his teammates. The heir-apparent, Linus Ullmark has been solid. He’s 4-0-1 with a .922 SV% and a 2.65 GAA. In the one game that he stumbled, Hutton and his teammates picked him up. With Ullmark, the Sabres don’t lose a step when their backup must come in to spell Hutton when he needs rest or should he get injured. Few other teams have this luxury. And an extra special tip of the hat and holiday blessing to former Sabres goalie Robin Lehner who has been conquering his demons and his competition with the Islanders. Stay strong, Robin. Brave men rejoice in adversity, just as brave soldiers triumph in war. 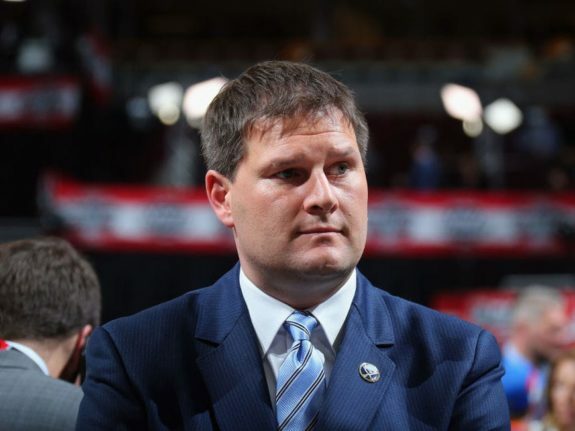 Famously slamming doors out of frustration and making promises of change during and at the conclusion of his first year as a GM in 2017-18, Botterill has already proved his hockey acumen on several occasions. He’s forged good relations in the locker room and the front office, he’s made timely and effective personnel changes, and he’s been the driving force behind the league recognizing that Buffalo can be a desirable place to play professional hockey again. Botterill struck gold with the acquisitions of Jeff Skinner, Connor Sheary, and Carter Hutton. They’ve brought talent, quickness and heart to a team that had been bereft for years. The Sabres now have not just a roster, but a team. A team that the fans can appreciate and support. No small feat, Botterill has brought excitement back to Western New York hockey fans. His 2017-18 team is threatening to contend for a long playoff run despite all off-season hockey ‘experts’ predictions of just a modest improvement in points but not positional standings. His players speak of working for each other and they play as a team. This, perhaps more than his amassing of players with skill, speed and a quality work ethic, have the team way out front of the projections. It’s both refreshing and contagious. This is the attitude of champions. 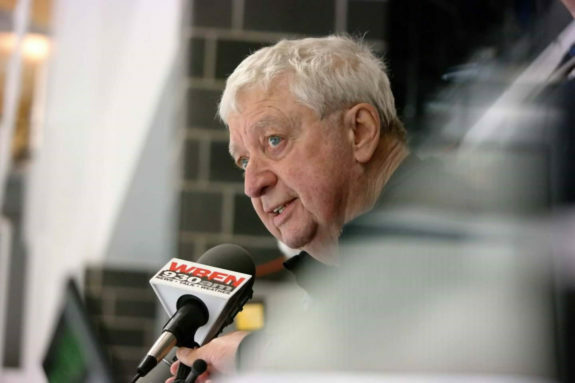 For almost 50 years the Buffalo Sabres have had the honor of an enhanced hockey experience through the knowledgeable and enthusiastic broadcasting professionalism of Foster Hewitt Memorial Award Winner, Rick Jeanneret. Every Sabres success has been that much sweeter as described live by “RJ” and then re-lived in countless replays. When RJ was diagnosed with cancer back in 2014, the Sabres reached out to Dan Dunleavy of Sportsnet 590 The Fan and Rogers Sportsnet. Dunleavy has rotated with Jeanneret as the voice of the Sabres in the years since and has been a good sport about RJ’s twilight career years. He has expanded responsibilities substituting when Brian Duff is off from his studio hosting duties. While there will never be another ‘RJ’, Dunleavy smartly delivers an engaging and enjoyable commentary when doing play-by-play and presents knowledgeable interviews when hosting. Just as the team on the ice has a bright future, Sabres fans are in good hands watching and listening when Jeanneret is ready to pass the torch. Cancer touches everyone. 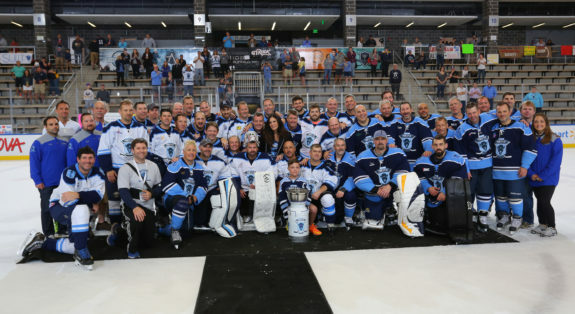 And over the past two years, The 11-Day Power Play and its sister event–The 11-Day Power Play Community Shift have raised a total of nearly $3 million to help fight it. These continuous 11-day-long games raise critically-needed funds for cutting-edge cancer research and wellness programs at Roswell Park Comprehensive Cancer Center. They support and improve quality of life for children, adults and families affected by cancer through Camp Good Days. And they grant wishes and amazing experiences to kids with life-threatening illnesses by Make-A-Wish Western New York. The 11 Day Power Play has inspired the hockey community to make a difference. It has rallied Western New York and brought out the best in all of us–families, neighbors, patients and businesses. Born from a simple idea by Founders Mike and Amy Lesakowski, the events have renewed our spirit in humankind. The future looks bright for the Buffalo Sabres. The team’s early success and never-out-of-it mentality has fostered a camaraderie in the community that hasn’t been felt in years. There’s so much to be thankful for, especially this year when the hometown team is once again competitive. We, at The Hockey Writers, count you and all of our readers as blessings and wish you a healthy and happy Thanksgiving.